These sharp questions to Ambassador Liu Xiaoming were not from the China experts or scholars on international issues, but some teenage high school students. However, their school is by no means an ordinary one. It produced the poet Percy Bysshe Shelley, the Duke of Wellington who commanded the battle of Waterloo, and 19 British Prime Ministers. It is one of the most prestigious secondary schools around the world, known for its reputation as “the cradle of the British statesmen” and for its “gentleman culture”. It is the Eton college. On the evening of October 17, the main building of Eton College, which is just across the river from Windsor Castle, the Royal Residence, appeared to be even more solemn in the rain. It instantly reminds people of the settings of the film “Harry Potter”. The students of Eton wore traditional tailcoats and shuttled in the rain, making people feel more like being in a film screen. Outside the Election Hall, the lecture theatre of the College, it was even more crowded. Here a speech will be given by Chinese Ambassador Liu Xiaoming at the invitation of the Frontier Society, a student society of Eton College. According to the requirement of the College, the lecture theatre generally accepts not more than 80 listeners. But as the speech attracted students from many surrounding schools, the number of applicants was far more than expected and eventually about 150 high-school graduating students entered the Election Hall. In the lecture theatre, not only all the seats were taken, but even the aisles, corridors and windowsills were fully occupied. At about 7 o’clock in the evening, Ambassador Liu Xiaoming and Madame Hu Pinghua arrived at Eton College. Headmaster Anthony Little and Mrs. Little warmly welcomed the arrival of Ambassador Liu and Madame Hu and accompanied them to the Headmaster’s official residence. They briefed the Ambassador and Madame on the history and tradition, the cooperation with China and the Mandarin teaching of Eton College. After that, Ambassador went to the lecture theatre in the company of Headmaster Little. As Ambassador Liu stepped into the Hall, the audience burst into a big round of applause. 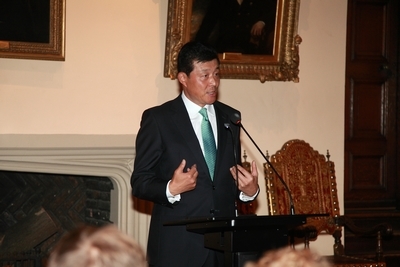 After a brief introduction of Fred Kim, Secretary of the Frontier Society, Ambassador Liu took the podium and delivered a speech entitled “China: ever old, ever young” to the teachers and students of Eton College. Ambassador Liu briefly introduced the history of China, which was splendid though with some setbacks. He said that the ancient Chinese civilization was rich and advanced, but China fell behind in modern times. In the 20th century, China was caught between the millstones of foreign invaders and civil war. The poverty, suffering and humiliation that Chinese people suffered were indescribable. Not until the founding of the People’s Republic of China, especially after it embarked on reform and opening up, did China achieve a rapid and comprehensive development. Ambassador Liu then pointed out that now the whole world is watching China. On how to get a clear picture of today’s China when there is a flood of information and so many perspectives, the Ambassador offered three observations. First, China is following a development path suitable to its national realities; second, China is still a developing country; and third, China is committed to peaceful development. Focusing on the worries about China’s future in the Western media, Ambassador Liu said that the Chinese people are confident in China’s future. First, the Chinese economy has great potential and a strong drive. Second, China’s development will be more comprehensive and inclusive, and the Chinese people will be better off. Third, China will play an even more active role in world affairs, and will safeguard world peace and promote common development with its own development. The development path that China has followed for more than three decades has profoundly changed China. We have every reason to believe that staying on this path will lead China to a brighter and better future. Ambassador Liu highly commended the efforts of Eton College in promoting Mandarin teaching as one of the earliest British schools to open Chinese language course. 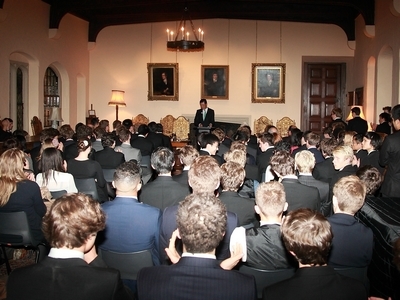 He also expressed an earnest expectation to the Eton students: “China and Britain are both great countries. We both made great contribution to human civilization. In this new era, China and Britain should join hands to promote common development. Through our collaboration we can make even greater contribution to world peace and prosperity. I hope my speech would inspire you to reach out and work with the young generation of China. Together you can build a bright future of China-UK relations.” Finally, in the warm applause of the audience, Ambassador Liu presented Headmaster Little with Chinese books and CD-ROMs. 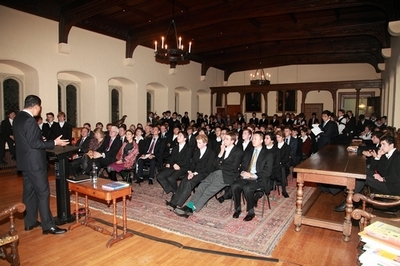 Throughout the speech Ambassador Liu manifested his familiarity with the history of Eton by mentioning many Eton elements, such as the famous Etonians including Shelley the well-known poet, James Bond who was “expelled by Eton for his talent in trouble making” and Sir John Gurton who shared this year’s Nobel Prize in medicine and was commented as being “too stupid for biology”, the settings for the film Harry Potter, “Eton plus Oxford” as the optimal and distinctively British combination of education, etc. This brought rounds of laughter and kept the audience in high spirit. In the Q & A session, the listeners became even more enthusiastic and raised sharp and tricky questions. Ambassador Liu gave wonderful answer to each question. On Diaoyu Dao question, Ambassador Liu thoroughly introduced the historical origin of the question. He said that as China and Japan were normalizing relations and concluding the Sino-Japanese Treaty of Peace and Friendship in the 1970s, the then leaders of the two countries acted in the larger interest of China-Japan relations and reached an understanding and consensus on “leaving the issue of Diaoyu Dao to be resolved later.” But in recent years, the right-wing force in Japan kept provoking and the Japanese government even announced its so-called “nationalisation” of Diaoyu Dao. Diaoyu Dao is an inherent territory of China since ancient times. China is willing to settle the dispute through peaceful negotiation and to make great efforts to this end. But it is imperative that Japan should immediately stop all stop all actions that undermine China’s territorial sovereignty, admit its mistake and correct it. Asked how to compare the 2012 London Olympic Games and the 2008 Beijing Olympic Games, Ambassador Liu said that the two events respectively had their own features and both were successful. While the Beijing Olympic Games presented a magnificent opening ceremony, the London Olympics fully demonstrates the history, local traditions and cultural essence of Britain. The Chinese public paid great attention to the London Olympic Games and gave it very positive responses. In particular, the London Paralympics greatly impressed the world. In each event the venue was packed with enthusiastic spectators. This is a full evidence of Britain’s humane care for the persons with disabilities. The Chinese delegation also performed well in the Paralympics. They led the medal table in terms of both gold and total medal counts. The delegation even won more gold medals than in the Beijing Paralympics. This also demonstrates the progress in the protection of the persons with disabilities in China. When answering the question about the outlook of China’s manufacturing industry, Ambassador Liu pointed out that the manufacturing industry in China is indeed facing some new challenges. Recently with the rise in wages and constant improvement in the welfare of the Chinese workers, the labour costs in China are increasing. But the overall advantage of China’s manufacturing industry remains. In particular, we should never forget that China is a big developing country. Although the GDP of some cities in the eastern coastal areas is close to the level of developed countries in Europe and America, the western region of China still has many comparative advantages, such as the low costs, the high-quality workforce and the preferential policies of the local governments to attract foreign investment. The future of manufacturing in China is still full of opportunities. China welcomes the foreign investors to the country’s western region. Ambassador Liu also answered questions on the China-US relations, the situations in the Korean Peninsula, China’s development mode, the “empty city” phenomenon, the ways of further boosting domestic demand, the expansion of market opening, etc. A better mutual understanding requires the communication and collision of ideas, and the development of China-UK relations needs the efforts of many generations. As the young generation will surpass the old ones, the China-UK relations will certainly have a brighter future. 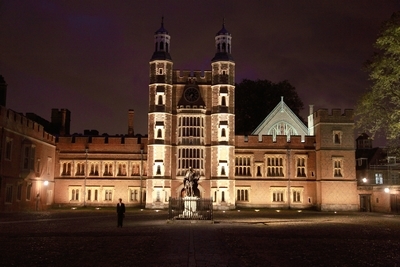 Founded in 1440 by King Henry the Sixth, the Eton College has long been known as the “cradle of gentlemen”. From the 17th century onwards, the Eton College grew into the most prestigious elite school in Britain. With its well-known strict management and very high student achievements, the College is recognized as the best secondary school in Britain and the training ground for the royal family as well as the political and economic elite in Britain. It produced 19 British Prime Ministers, the poet Percy Bysshe Shelley and the economist John Maynard Keynes, and is also the Alma Mater of Prince Charles, Prince William and Prince Harry. Of its 250 graduates every year, over 70 are admitted by the University of Oxford and 70% go to the world’s famous universities. At present the Eton College has nearly 40 students from China, forming the next largest group of non-British students next only to those from the United States.